Irritated of getting suspended of Twitter often ? Hell, that is really pathetic. I was suspended 3 times when I started to use Twitter. The saddest part is this happened to me within 4 months. I was like "What the Hell ?". That was a year back and somehow I am maintaining my account from getting suspended any more. I have been seeing some of my followers getting suspended often, and some even used to create new accounts again. It is really frustrating to get suspended often when you are just about to show interest on it. Trust me I had been through. 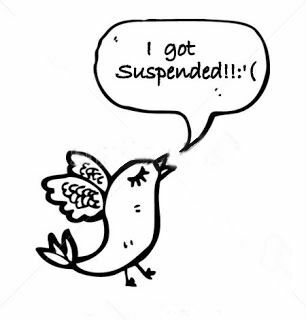 Here, I wanted to make this post for all the tweeps on Twitter who hate getting suspended often. The following tips will help you to know why you are getting suspended too often and also help you avoid getting suspended. I am sure to tell you that if you follow the below tips, you'll never get suspended very often. Okay... The first and foremost thing twitter guys check on your profile is whether you are using your account to spam the stream. When I say "check on your profile" doesn't mean they look into your privacy. They will get notified if there is an different activity relating to spam. Well, it happens all the time when we use gain free followers tools that are available millions a day. Gaining followers is a vital thing considering Twitter, but you can gain followers by other means manually or by marketing you profile. Most of the free followers gaining tools send tweets with their links automatically even when you are not online. Don't make Twitter guys see you as a spammer. Like I said, while using those third party followers gaining tools they get you hundreds of followers a day. You can use once a day. It's no biggie from your side. But using more than one followers gaining tool a day gets you large number of followers. But the fact is Twitter watchlists the profile that follow aggressively. When you follow a 100 numbers its not a big deal. But when you are said to follow more than 300 or 400 a day, it is a big deal. You may get suspended so for some days until you request a ticket. Unnoticing will lead to permanent suspension. The same applies to unfollowing too. You can unfollow a certain number of users a day. More than the limit resulting in suspension of your account. It is said in Twitter that you can follow as many users only if you are visiting their profile and then click the unfollow. It may take much time to visit the particular profile and unfollow it. So, try not to unfollow too many a day. Use some tools that allow only a limit (mostly all free tools have limit for both follows and unfollows). Note that you should not use all of them a day. It leads to aggressive behavior. Avoid abusive tweets on Twitter. Don't make a scene over your followers or anyone on Twitter. Who knows they may block you for your behavior with them. There is also a chance of getting suspended when you are getting blocked by many users. Try and avoid little fights with your tweepers. Be user-friendly and interactive. Mostly try to never mind anything so serious on Twitter. It will help you avoid getting blocked as well as suspended. Most of the times, people will block you because when they receive spam DM's from you. But you have no idea when and why you sent them a spam DM. Its because of the third party tools you are using that are not authorized. Twitter suspends you for duplicating the tweet contents. That is you cannot tweet a content more than one time. You may have seen when you try to tweet something and it shows an error message "Whoops!! You already tweeted that!". You can tweet it differently meaning the same content. Avoid duplicating contents on your Twitter Stream to stay out of suspension. Mentions should be used properly in Twitter. It provides you the facility that you can tweet any person with the @ mention even though they are not following you or vice versa. But when you use the mention in most cases and you're not responded (unresponded mention) , then it is considered as spam. There is a chance of you getting suspended for reckless mentions all the time. Moreover, the person who you have mentioned may even block you leading to the suspension of your account. So if you want to mention someone, its okay. Use polite words to attract them so that even if they don't likely to reply you, won't block you. Behave wisely to stay out of trouble. Once suspended, it'll be like a real irritating moment for anyone. You have to wait for some time to request a ticket and also it'll become 2 days at normal cases. If you try to follow the above mentioned tips, you'll never get suspended again. I really Love this. Its Cool. Thanks Brother. Sometimes that happens without any reason, it's a shame!! May be they don't like it to be too spammy. Awesome post thanks. I see a lot of people complaining that they got suspended after violating the tos. @anon, there's no such a thing as "safe". It's how fast you follow. Just don't over do it. I agree with what @Pete said. Its just how fast you follow and unfollow as well. If you overdo, you'll risk it. Good tips, thanks for sharing. I had my account temporarily suspended for publishing a Google Reader RSS feed to my twitter account, but only for 3 links per day. Suspended for two months and received no replies to my appeals. Quite frustrating. That's frustrating. BTW getting suspended is also possible if your account got hacked and spreading spammy DM's all over to your followers. I'm not sure this suits your case. I was suspended this morning. First time. I have been tweeting both houses in congress but mostly one side. The last two days I finally tweeted the other side. Since this one two day period, I am suspended. I guess you could call it spam but I was communicating my civil thoughts to the party members. No animosity at all. I surmise the latest tweets were to the wrong side. Sounds partisan on the Twitter side. I didn't do anything, but I still got suspended. I JUST opened this account. And I think it's because it's not private. I might get back into the twitter scene. I left due to constant suspensions. I'm sure I've been through several accounts. Reading this article makes me want to start using the site again. Maybe I can avoid suspensions this time. Hi, I got suspended just for tweeting my website: http://wholesaleboutiqueclothing.blogspot.co.nz/ Not sure why they would suspended me for that but they did. Great piece of advice. Thanks Brother! It helps a lot! For me, the trick is to not falling for the attractiveness of following quickly. As well, it is convenient for you to have an idea of the profile you want for yourself! If you have an objective in mind, then it will come more naturally to avoid potential pitfalls, as you will be building your follower base steadily. I totally agree on the aging theory, as it seems proven right in my case: as a newb, I got "The Eye of Sauron" almost immediately , but now that the profile is "aged" or matured, the community grows more solid and not only followers but friends as well! To me, it ended up like this: ACT NATURALLY, like a human will do, get real! it is not true that you can follow that many... as well as not everything is in your taste to get RT worthy, so play consistent, and you'll be safe. Do not get obsessive if you get suspended. Work to get it back and start to act naturally, like nothing happened. If you get too obsessive, then you will act irrationally and most likely end up violating any of the TOS and get suspended again. Break the vicious circle. Thanks again! That's my 2c worth of advise. I was also suspended after being with Twitter for 3 years. Had thousands of followers. I have decided not to use it any more as don't want to waste any more of my time building relationships on there only to be closed without warning. We are all at the mercy of Twitter here! I have started using facebook more, although its harder trying to promote a business on there. I also signed up to another site to promote my business called zoomspec.com and pinterest etc. Someone should come up with an alternative to Twitter - maybe the fact they have just floated is somehow behind this? Many companies are faced with the dilemma of how to get real twitter followers because the popularity of Twitter as an important marketing tool has given rise to service providers who offer services of fake twitter followers. The companies which buy the services of these fake twitter followers discover that the accounts drop after one or two tweets and they do not get the benefit of getting a sustained chain of recognition for their product. Therefore, it is important to go through a tough and rigorous selection process to engage a service provider who has genuine twitter followers and promise to provide a long and sustained action without many drops. I have almost 3,000 followers. My acct is 6 months old. I got suspended 4x for following and following too aggressively when I first started the account. I was more careful to F/UF slowly by the hour. After I passed 1,000 and rose to 2,800 I had no problem F or UF. I used the post-it note feature on my desktop to keep track of my F/UF numbers by the hour, which was limited to 7. I have zero egg accts and no fake followers - I make sure of that. I don't F more than 100 p/day and I don't UF more than 100 p/day. I still got suspended today, after following only 30 people in 6 hrs. There is a lot of chatter on forums that once you pass 2,000 followers, you can still follow up to 1,000 people, but you can't follow to quickly unfollow (within 2 hrs) if a person you've just followed won't follow you back. I gather, it's the unfollowing that annoys Twitter. I don't see why, it doesn't annoy the ppl I try to follow. Does anyone know, is there a limit of suspensions Twitter holds that leads to a permanent ban, for example, after 8 suspensions, you are automatically banned? I wish someone would come up with a new version of this Twitter website --- twatter? Something. Anything. I feel that Twitter should give you a warning BEFORE they suspend you. And once people have accts that are 6 months, a year, 3 years old, those older accts should be treated with more respect. As soon as my account was unsuspended I decided to deactivate my @pjl20101 account. Apparently I was sending out multiple unsolicited @replies and mentions. Trouble is you can't argue with the twitter staff who run it so I decided to call it a day. Basically it seems unlikely or impossible that I will create a brand new account as twitter and I don't get on, they are just too political. Great article & useful tools! You can also use this site => http://twitterunfollow.net. Here you can find people that don't follow you back. Super easy to use! They should simply make follow limits instead of banning people. Once you hit the limit you can't follow any more, easy. They get you to follow their tos and you don't lose your 30k account. So, to summarize your post, don't act like an A55HOLE. Anti-Semites never get banned, I always get banned for arguing against their racism!